WASHINGTON (CN) – Senate Majority Leader Mitch McConnell said Monday he supports a congressional investigation of Russia’s attempts to influence the 2016 election through a series of coordinated hacks. The Kentucky Republican’s announcement comes after reports emerged late Friday that a secret CIA assessment had discovered intervention by Russia to help Donald Trump win the presidency. 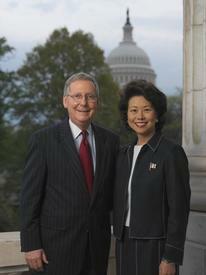 McConnell – whose wife, Elaine Chao, will serve as Trump’s secretary of transportation – said the Senate Intelligence Committee should conduct a bipartisan investigation. White House officials have for months been wringing their hands about the Russian government’s role in hacks that resulted in the public release of emails from Hillary Clinton campaign chair John Podesta and the Democratic National Committee. Obama amplified the call on Friday in announcing that he had requested a full intelligence review of the situation, seeking a report before he leaves office on Jan. 20. Though Democrats have been vocal in asking for Congress to take action, Republicans have largely stayed quiet with some notable exceptions. McConnell’s statement Monday is the first time he has come out in favor of such action, but he stopped short of saying he believed that Russia acted with the intent of helping President-elect Trump rather than simply to sow distrust in American democracy. Blaming the Obama administration for the situation, McConnell said Russia exploited softened tensions to expand its influence. He also slammed resistance by Republicans to the findings that the intelligence community has brought to light. “It defies belief that somehow Republicans in the Senate are reluctant to either review Russian tactics or ignore them,” McConnell said. McConnell agreed Monday that the standing committees that handle national-security matters should be the ones to conduct any investigation into Russian interference, rather than a special committee assembled just for that purpose. “I agree with Senator Schumer, Chairman McCain, [Sen. Richard] Burr and others, this simply cannot be a partisan issue,” McConnell said Monday. But even as prominent Republicans come on board, Trump has continued to dismiss the allegations as purely partisan attacks. On a conference call Monday, Trump transition spokesman Jason Miller suggested the rumors and allegations come from people who “are bitter that their candidate lost” the election. Undermining the president-elect’s protests, however, reports emerged this weekend that Trump will name as secretary of state Rex Tillerson, the CEO of Exxon Mobil who has close ties to the Russian government.